Our school uniform colours are sapphire blue, black and white. 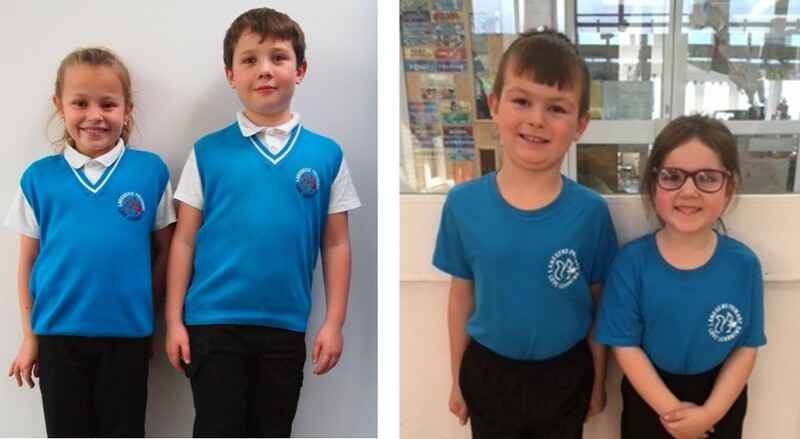 School uniform looks smart and ensures all the children feel a sense of equality. We want all of our children to look superb and be very proud of our school and it is important that they all look fabulous! The majority of our uniform can be purchased at the school office or paid and ordered through our online payment system, School Money. If you pay online please send an email to uniform@lanesendpri.iow.sch.uk to ensure your order is ready for collection at the office. Some items are not kept in stock and ordered as requested. All children should wear smart, sensible black school shoes. We ask parents to use their common sense when purchasing shoes. We do not allow girls to wear high heeled or built up shoes as they can be unsafe in the school environment. Fashionable long boots and open toed sandals are also not allowed. With our shoe policy, shoe wear is for outside and inside we give children the option of no shoes, soft-indoor shoes or slippers. Sapphire blue logo T-shirt, black shorts, black or white socks, and any colour trainers. them at the end of the school day. (We prefer no jewellery at all in school, but do permit stud-type earrings). Please name ALL school uniform.